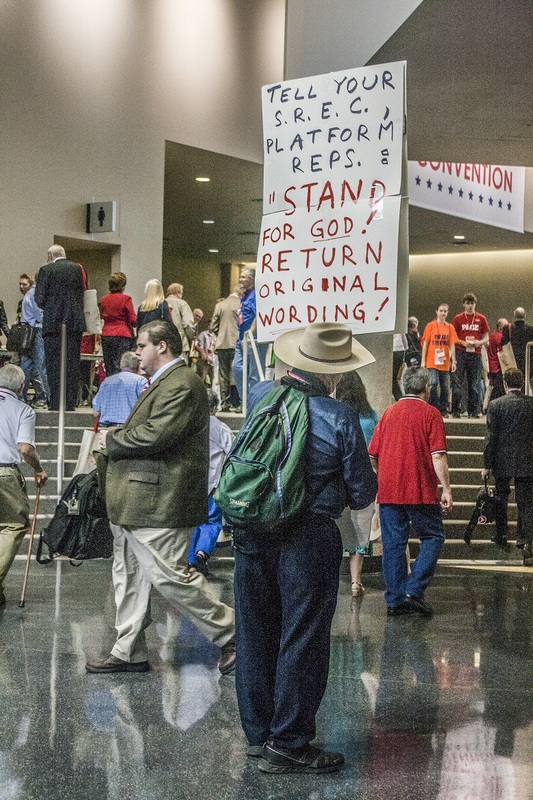 Ever since we attended the Walker County Republican Convention, we had been hearing many anecdotes from previous State delegates about the State Convention, and not all of the stories were good. 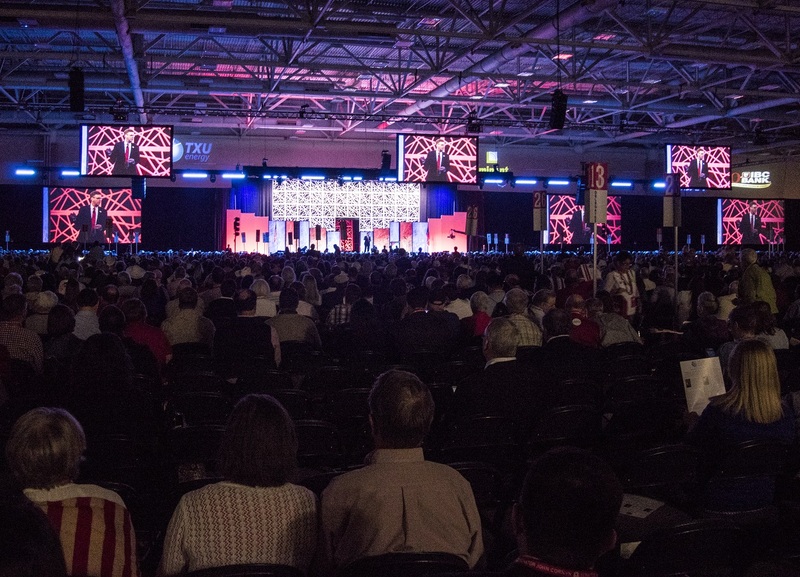 So we were equal parts excited and anxious to see what the 2016 Republican State Convention would be like in person. The Convention is able, in theory, to flow smoothly because it is governed by Robert’s Rules of Order, and we began the convention attending the parliamentary procedure training provided by Richard Hayes, the Parliamentarian. The procedure is used often enough that this training would benefit us tremendously in other situations. The Parliamentarian led the training and gave us a sheet to help us follow along. This sheet was extremely helpful, but it was his personality that made the training interesting. After learning the basics of how the Convention will work, we had a break to spend wandering through the exhibit hall. There we were able to buy GOP pins and other Republican memorabilia. 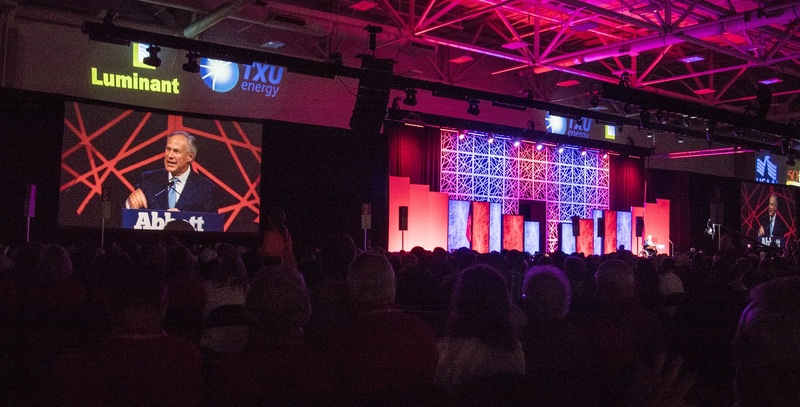 The exhibit hall was also filled with information booths of different candidates aside from the Presidential race, making for a fun tour, followed by our arrival at the large hall for our first general session. We weren’t sure what to expect of the session, but we were grateful to have many delegates there looking out for us. Thomas Leeper, Stephanie Fors, Mike Yawn, Kara Veinotte, Cynthia Prehoda, Richard Yawn, Dorothy Yawn, Gerald Skidmore, Bobby Gardner, Micah Slaughter, Tore Fossum, Larry Hughes, Leah Boyd, Chad Byrd, Kay Deahl, and Judy Emmett were all on hand to explain things, laugh with us, and sometimes cringe with us. The day held much promise. We began the session with a prayer, an exuberant national anthem–including the rarely heard 2nd verse–and the pledge of allegiance to the American and Texas flags. 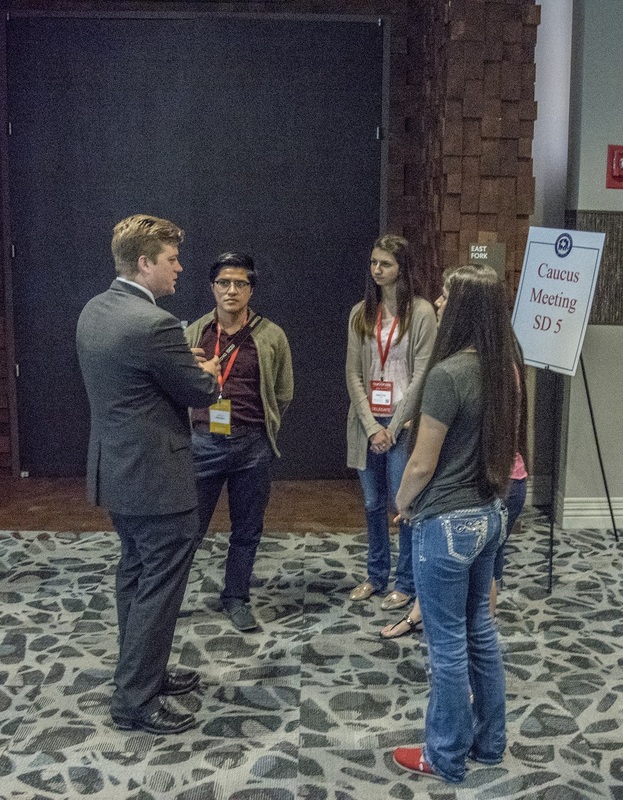 After the opening ceremony the session began with a brief overview of convention affairs by the Republican Party of Texas Chairman Tom Mechler. These affairs included various delegate seating issues, which were quickly resolved by the delegate’s votes. Even though I am unable to vote as I am attending as a guest, it was still insightful to look into these procedures. In this case the cooperation in delegate participation and Chairman efficiency proved for a speedy process that allowed for the rest of the session to continue. After the Chairman’s proceedings, we all enjoyed a passionate discourse delivered by our state’s Governor Gregg Abbott. In his speech he voiced his opinion on how he believes the nation’s political spirit ought to be shaped, a message received with enthusiasm. This was most noticeable when Governor Abbot received standing ovations at passionate moments in his speech. Similarly, Lieutenant Governor Dan Patrick, Speaker of the House Joe Straus, Railroad Commissioner Christi Craddick, and Land Commissioner George P. Bush also joined the stage for their remarks. All of the enthusiasm from the moving speeches made us look forward to discussing our thoughts over our upcoming lunch break. 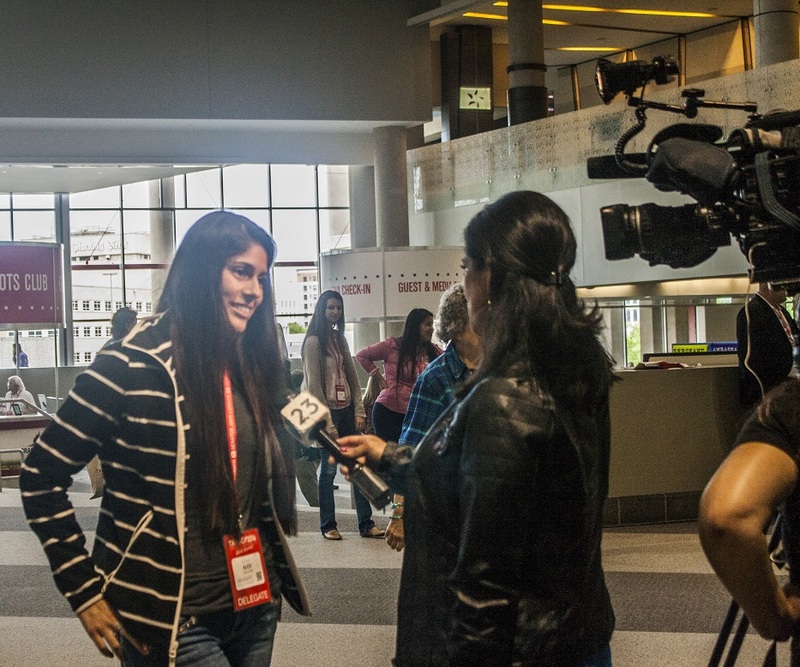 Before we sped off to lunch, Alex was caught by a Univision news crew for a quick interview. Alex expertly fielded questions on topics ranging from Hispanic support for Donald Trump to the direction of the party, this burgeoning barrister’s fifteen minutes of fame ended, and we all headed to Cindi’s New York Deli for lunch. …and our new experiences thus far. After lunch we were ready for our first Senatorial District Caucus Meeting, where all the delegates from Senatorial District 5 (Senator Charles Schwertner’s District) met to elect representatives to the Permanent State Committees. 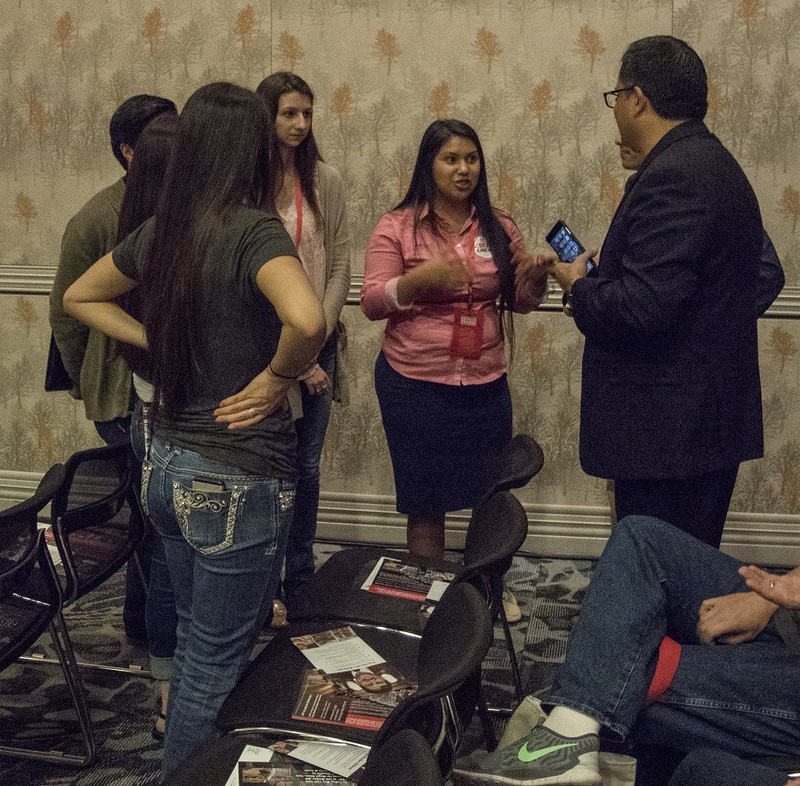 Not only would we elect representatives, but we also were privileged to meet with members of the Texas Legislature such as Representative Larry Gonzales and his Chief of Staff, Chris Sanchez…. …and his Chief of Staff, Tom Holloway. Speaking with both Chiefs of Staff offered helpful advice as we prepare to interview for the Austin Internship Program beginning in the next legislative session. During our Senatorial District Caucus Meeting we were assembled by counties and began by electing a Chairman to lead the caucus. 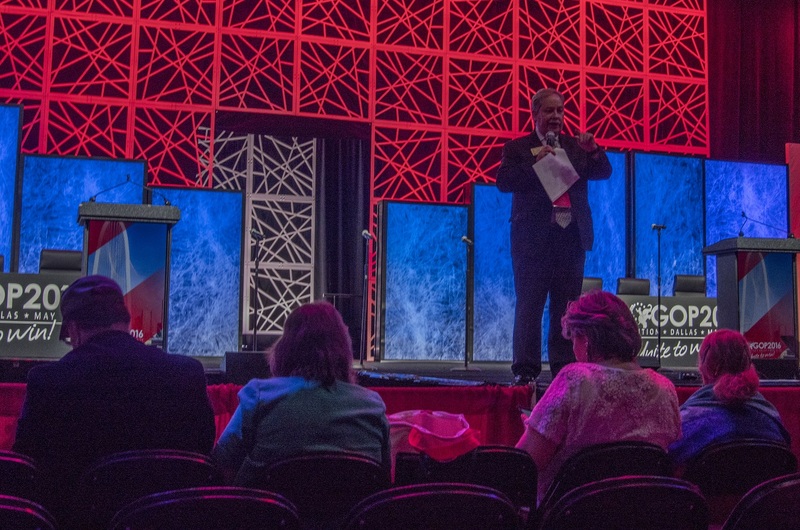 Immediately following, we nominated and voted on our appointments for the Rules Committee, Platform Committee, and Credentials Committee. 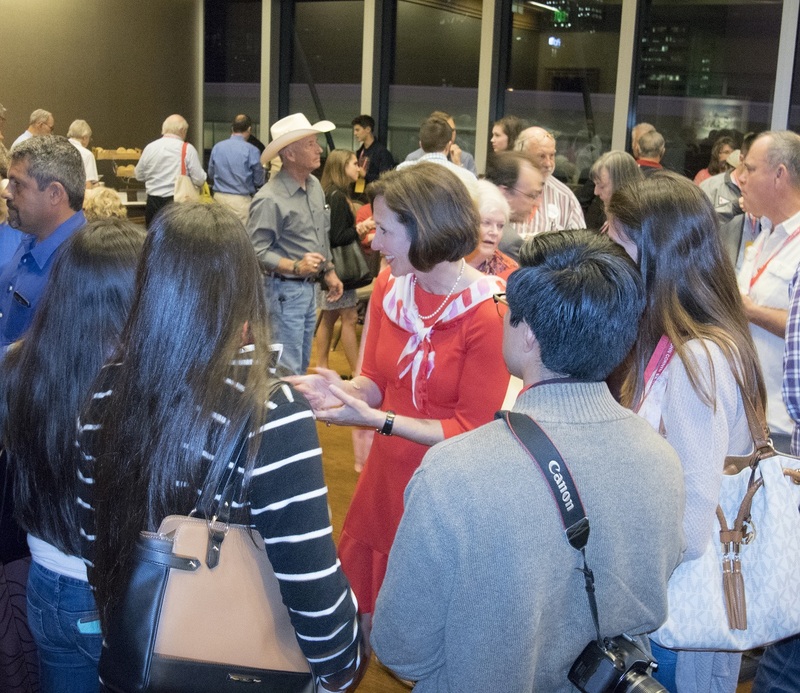 Electing representatives from each senate district in Texas ensures that we have representation in each procedural and policy area–people we trust to represent our views at the state level. 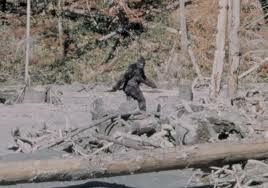 As rare as it is to meet with state-wide elected officials, we saw something even more rare. Yes, we saw Ryan Brim working! …but, no, Ryan had obtained a job as Page at the convention (thank you Linda McKenzie! 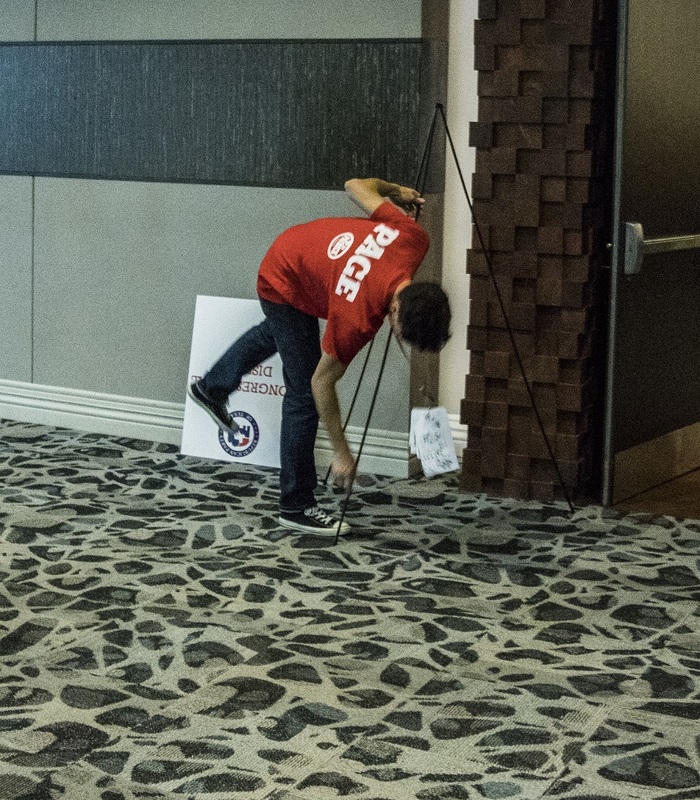 ), and he had various tasks such as posting contradictory signs to confuse bewildered delegates. After a quick break and stroll to the opposite side of the convention center, we gathered for our first Congressional District Caucus Meeting. The Congressional District Caucus Meeting elects representatives to National Committees. Interestingly enough, in this meeting it took longer for people to find their seats than it actually took to vote! The short meeting was a plus, because after a long day of labor and lawmaking, we were ready for the southern food of Ellen’s. The newly renovated restaurant was homely and offered a variety of traditional southern plates and breakfast options. The group experimented with salads, breakfast steaks, shrimp and grits, and chicken fried steak. The restaurant had just moved locations and the service was a bit rocky (menus please! ), but we all enjoyed the food. We also enjoyed the interesting conversation about the day’s events at the 2016 Republican Convention. Thomas Leeper, First Assistant City Attorney for Bryan TX, joined us and shared with us some of his favorite legal books, advice on law school, and a few of his law-school and career experiences. 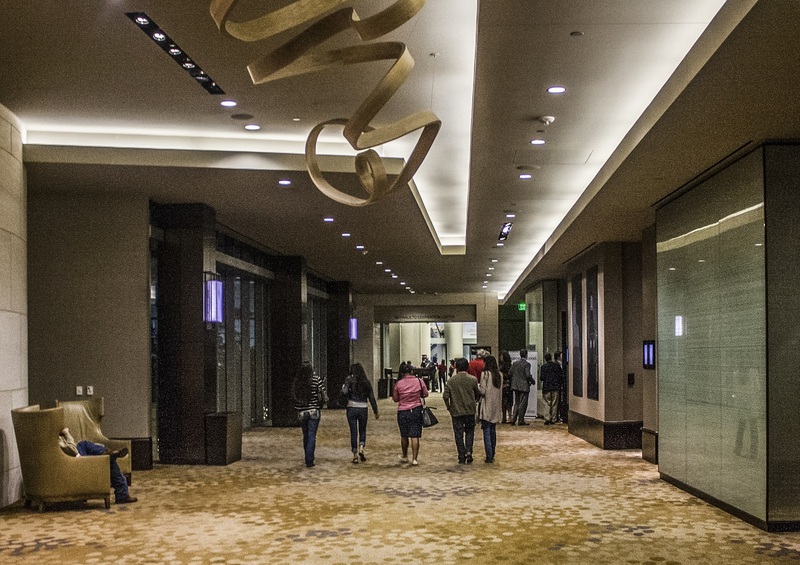 With dinner complete, we headed back to the Omni, hoping to walk off some of the food. On the way, we stopped at one of Dallas’s civic engagement spots: one of the Big D signs posted around town. 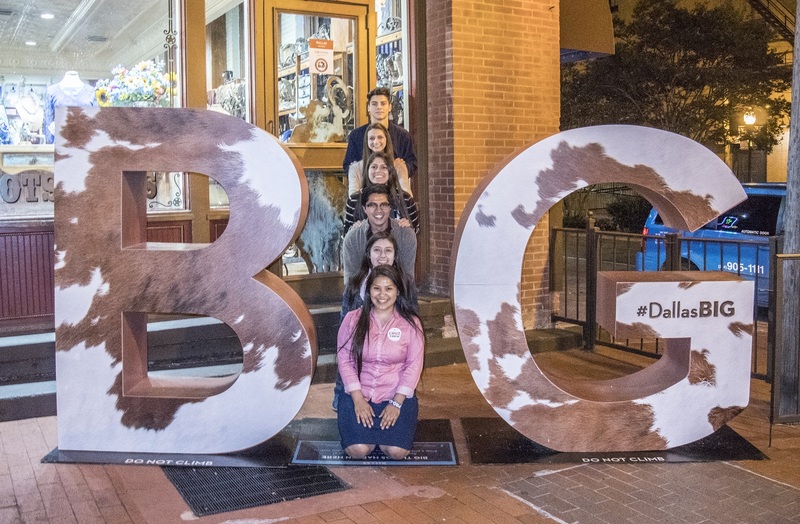 Promoting the town logo of “The Big D”, the City has put up signs around town with a giant “B” and “G,” with a space in between. This space is designed to be filled by citizens, turning “i” into the City–Big D. And that’s what we did. But that was our only stop, because our destination included an ice-cream social by Senator Lois Kolkhorst and one of her staff members, Matthew Russell. It was great talking with a wonderful leader within the party and state. Many of her constituents were present and she made time to talk with all of them. It definitely showed us the importance of being a leader and maintaining strong relationships with constituents. After a long day, all of us were exhausted but also excited to watch another convention day unfold. We have learned so much and have met and watched many great leaders. We hope to take what we have learned back to our communities! Alex, Megan, Kaitlyn, Karla, and Brian would like to thank all of the Walker County Republicans who voted them as delegates and who have welcomed them to the Convention. This trip was self-funded and was not subsidized by either SHSU or the LEAP Center.